Won't Back Down, due out on September 28, is a fictional account—not a true story, of the operation of a school reform strategy called the parent trigger. 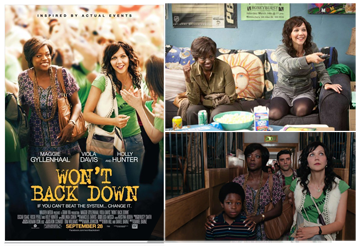 Won't Back Down is produced by Walden Media, the same group that produced Waiting for Superman. Won't Back Down's subject is the "parent trigger,"a strategy being promoted by the pro-privatization organization, the American Legislative Exchange Council (ALEC) and an organization called Parent Revolution, which was launched by charter school operator Steve Barr with funding from the Bill & Melinda Gates Foundation, the Broad Foundation, the Walton Family Foundation, the Wasserman Foundation, Rockefeller Philanthropy Advisers and others. Parent Revolution is an example of what is known as an "astroturf" organization; it pretends to be a grassroots group of parents, but it has, in reality, no significant grassroots. In California in 2010, the legislature passed "parent trigger" enabling legislation for parents to be able to seize a school by petition, replace staff, and turn operations over to a charter management organization. No real life example of a "parent trigger school" exists at this time. Parents tried a parent trigger petition at one school in Compton, California, but the charter school that was to have taken over the school instead founded a school at a nearby location. At another site, the parents' seizure of the school has been held up in a court action. Center for Media and Democracy publishes analysis. "Won't Back Down" Film Pushes ALEC Parent Trigger Proposal. This is a comprehensive analysis of tho groups and individuals who originated and produced this film and those who are promoting it. Please read this. Here is a fact sheet from Parents Across America. Here is the story of real parents, parents who are organized activists in New York City, protesting at the red carpet opening of the fictional movie, Won't Back Down. And here is a link to the video created by New York parents of their protest during the red carpet opening of the film. Save Our Schools and Parents Across America respond: Won't Back Down: The People Respond. NPR review says "Won't Back Down"Takes a Too-Easy Way Out. Randi Weingarten, President of the American Federation of Teachers, proclaims that the anti-union stereotypes in Won't Back Down are worse than those in Waiting for Superman. Our own UCC JWM in-depth resource for the beginning of the 2012-2013 school year explores the public value of public education and the danger of privatization.